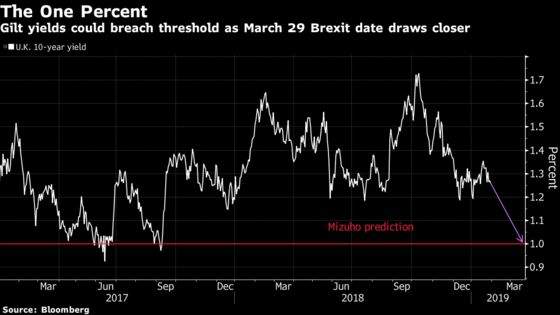 (Bloomberg) -- It’s time to buy U.K. bonds as a no-deal exit from the European Union looms large, according to Mizuho International Plc. Parliament’s vote to send Prime Minister Theresa May back to Brussels to renegotiate the Irish backstop is facing the bloc’s refusal to do so. Ten-year gilt yields could therefore fall to touch 1 percent for the first time in 16 months as investors seek havens and the March 29 departure date gets closer, the Japanese bank said. While sterling has been resilient to recent Brexit developments, there are already signs of fear within the bond market. Traders are hedging for a drop in the currency and an increase in import prices, keeping inflation expectations elevated relative to the euro area, while bets on the next Bank of England interest-rate hike have been pushed back to the middle of 2020. U.K. assets largely shook off the prospect of needing a new deal with the EU after lawmakers voted Tuesday in favor of an amendment to seek “alternative arrangements” on the Irish border. Analysts cited the vote showing a majority in Parliament against a no-deal exit as preventing a rout, but it is not legally binding, while a motion to extend the Brexit deadline was voted down. Ten-year bond yields fell two basis points to 1.25 percent by 2:25 p.m. in London Wednesday, while the pound climbed 0.2 percent to $1.3088. Mizuho said that the two-year, 10-year gilt yield curve, a barometer of expectations for the economy, could flatten to 10 basis points, a level not seen since the global financial crisis.